Foreign Affairs Minister Chrystia Freeland is linking the lifting of "absurd" U.S. tariffs on Canadian and Mexican steel to the ratification of the new North American free-trade deal. 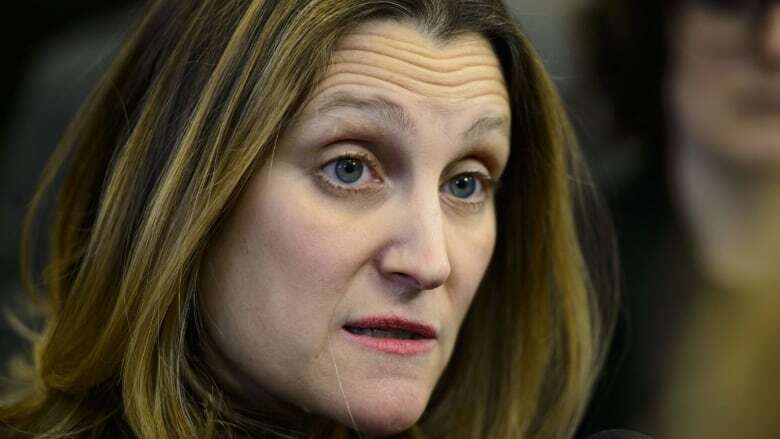 Dealing with the tariffs — imposed by President Donald Trump under a controversial national-security provision of U.S. law — is a key part of the ratification process, Freeland said Wednesday. Freeland says she's heartened by the recent comments of American lawmakers who say the new trilateral trade agreement can't be ratified with the "Section 232" tariffs in place. "I am very glad to be hearing both in private meetings and in public statements from a number of U.S. senators, members of Congress, that they share Canada's view that the 232 tariffs should be lifted," the minister said in Ottawa before departing for a NATO summit in Washington, where she was expected to press the issue further. "And that very much needs to be a part of the NAFTA ratification process." "I'm calling on the Administration — specifically, President Trump — to promptly remove Section 232 tariffs on steel and aluminum imports from Canada and Mexico. This will help clear the path for the U.S.M.C.A. agreement," wrote Sen. Chuck Grassley, the chair of the Senate Finance Committee, using the American acronym for the new agreement. Section 232 of the United States's Trade Expansion Act lets the president impose duties on imported goods if the imports threaten U.S. national security. Trump asserted that the U.S. needs a domestic metals industry for national-security reasons, so imports of steel and aluminum are a danger. Freeland's remarks indicate an evolution in Canada's position on the sanctions and the acrimonious three-country renegotiation of NAFTA. She has said previously that two were separate issues that could not be linked, even though Trump's Commerce Secretary Wilbur Ross said the tariffs were actually imposed because of what the Americans viewed as the slow pace of the talks last spring. Canada has imposed more than $16 billion in retaliatory tariffs on U.S. products, a list that Freeland said is constantly being examined so that they will have "the greatest impact" on American consumers. She said Canada has been consulting on retaliation strategies with Mexico and the European Union, which was also hit by the 232 tariffs. "Our government feels very strongly — and indeed I think all Canadians feel very strongly — that the 232 steel and aluminum tariffs were illegal, unjustified and frankly absurd in the first place," said Freeland. "Now that we have actually concluded our negotiations on a modernized NAFTA there is all the more reason for those tariffs to be lifted." Freeland travelled to Washington later Wednesday for a meeting of NATO foreign ministers to mark the 70th anniversary of the transatlantic military alliance. Her first meeting was with U.S. Secretary of State Mike Pompeo, and senior officials said she intended to press for the lifting of the tariffs in that meeting. With the clock ticking in Canada's Parliament towards a June ratification deadline — before a summer break that probably won't end until after the election due in October — Freeland remained non-committal Wednesday about moving forward on the necessary legislation with the tariffs still in place. Some leading U.S. Democrats in Congress say they won't approve the new trade agreement unless it is strengthened to force Mexico to adhere to tougher labour standards that elevate the rights of workers and their unions. Mexico says it will introduce labour reform legislation in its Congress before it rises on April 30. Freeland wouldn't say whether that would be enough for the Canadian government to move ahead with ratification in Parliament. Canada is watching the ratification process in both countries and Canada wants to "move forward in a co-ordinated way when it comes to the NAFTA ratification," she said.